The Aspire S3 is a bit of a jack-of-all-trades. However, not every product needs to be a king to be a success. It's only the battery life that really disappoints here. The Acer Aspire S3 is an Ultrabook-style laptop with a difference. It's quite light, portable and good-looking, but also incorporates a dedicated graphics processor, making it one of the few laptops in its class that could be called a gaming device. What's the price of this sort of versatility? 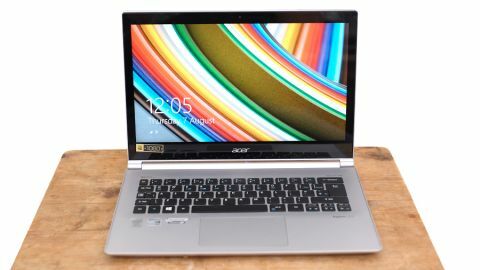 The Acer Aspire S3 with the Nvidia GeForce 735M cost £799 (around US$1280, AU$1470) at launch, but that was a good few years ago now, so you can pick this up at some very competitive prices. Read on to see if we still think the Acer Aspire S3 is worth buying in 2017. The Acer Aspire S3 has been around in various guises for a few years now, but the 2014 edition is quite a departure from the old models. Where the original Aspire S3 was quite rightly regarded as a bit of a MacBook Air rip-off in its looks, the new version looks a lot closer to the Acer Aspire S7, an Ultrabook with a snazzy glass lid. In order to keep costs down, the Acer Aspire S3's lid isn't made of glass, but it still looks and feels as if it is. The aluminium frame is lacquered with several layers of glossy paint, providing a look quite unlike the metal underneath. The rest of the Acer Aspire S3 design is sound, if not quite as pristine and perfect as the very priciest, prettiest Ultrabooks. The prevalence of obvious seams and the slightly uneven distribution of the chunky screen bezel mean it's not as pretty as a MacBook Air. But then few laptops are. In practical terms, the Acer Aspire S3 is very good. It weighs 1.55kg and is 17.8mm thick at its thickest point. The S3 doesn't match the thinnest or lightest of Ultrabooks, but a couple of deliberate design choices prohibit that from being remotely possible. First, there's the use of dedicated graphics: the vast majority of slim laptops use graphics processors integrated into the central processor chipset. There's also the storage type inside. The Acer Aspire S3 uses a hybrid drive, which provides 500GB of traditional hard drive storage and 16GB of solid state memory to grease the system's cogs for the kind of instant-on performance people expect from an Ultrabook. Hard drives are, generally speaking, chunkier than SSDs. But they are also far cheaper if you want a decent amount of storage. Unless the other laptop in contention for your cash is a 13-inch MacBook Air, which is significantly lighter at 1.35kg, the little sacrifices in dimensions aren't worth worrying about too much. Even the dedicated GPU-free, SSD-equipped Samsung Ativ Book 9 Lite is still 1.44kg and 17mm thick. A clear difference? Yes, but not a grand one. The connections you get on the body are sound for an Ultrabook. There are two USB 3.0 ports and another USB 2.0 one, plus an HDMI port for connection to a monitor or TV. There's also an SD card slot with a plastic bung to keep it free of grime when not in use. All the connections are on the sides, with the back reserved for a heat outlet. There's no Ethernet port, though. Instead there's an Acer Converter port, which is a proprietary socket. With a separate (not included) cable, you can turn this into a VGA port, or a RJ45/VGA/USB 2.0 combo. What's missing? The obvious one is a Mini DisplayPort.